We've added several new merge fields to our emails. A 'merge field' is a special bit of text you add in an email (such as '$FIRSTNAME$) which will be replaced with (in this case) the recipient's first name before the email is sent. 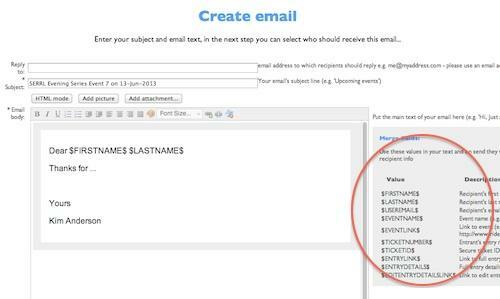 Typically you use them to customise each mail, without having to write each mail out individually. They can be very useful - for example you might want to send out an email to every entrant asking them to check their entry form details and correct any mistakes. Using merge fields you can include not only each entrant's details in the mail itself, but also a personal link they can use to go straight to their entry form and make any corrections. Being able to include this information in the email itself will likely lead to many more entrants responding and correcting their details than simply explaining the process to them and expecting them to take the necessary steps. Next: Membership reports with graphs!